The scoreboard in Tallaght Stadium was 1-0 to Special Olympics Ireland from the get-go, President Michael D Higgins insisted. Despite winds blowing the stage down the night before, the opening ceremony went ahead as planned. 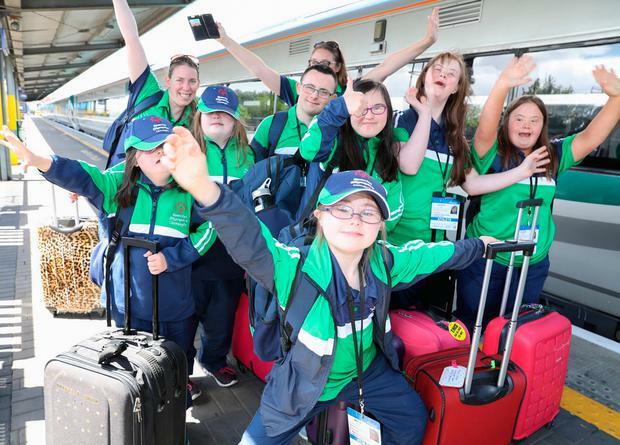 Thousands of athletes, coaches, volunteers and supporters turned out for the Ireland Games. Aged between eight and 76, the competitors insisted they were there to showcase the best of their abilities at the Games which will begin today and carry on across the weekend. Some 1,600 athletes are focused on next summer's World Games in Abu Dhabi. Paul Kirrane (32) from Ennis, Co Clare, had previously played golf at the Games when they were held in LA in 2015. This time around he was chosen to represent Munster in bowling. He said the opportunity was exciting and praised the vast crowd that had come out to back the athletes. "They've come out in big numbers, it's phenomenal," he said. Stephen Fagan (27), from nearby Firhouse in Dublin, had one thing on his mind going into today's first football match. "I'm very excited, looking forward to it now, all the hard training paid off," he said. "I want to score plenty of goals and play well for the team," he added. In a rousing speech as he officially opened the Games, President Higgins paid tribute to the competitors - and everyone that had been involved in making the Special Olympics what it is over the past 40 years. "What has been achieved has been so impressive. "Above all it has been so inclusive and I want to pay tribute to all those who over those years have made it possible year after year," he said.